Our guide to Corbels offers detailed descriptions of companies such as Master Wood Carvers and ArchitecturalDepot.com. Online seller of cabinet hardware, bath hardware and accessories, carved wood mouldings, kitchen islands and, yes, even kitchen sinks. 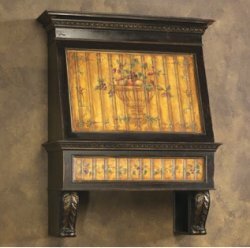 Hand-painted range hood finishes a Tuscan style kitchen.